Ray sent this photo and message: "Your Reunion Committee met January 16, 2010 to prepare and mail out the registration materials for our Spectacular 50th Reunion. Here's a photo of the committee enjoying food and fellowship after the work was done. 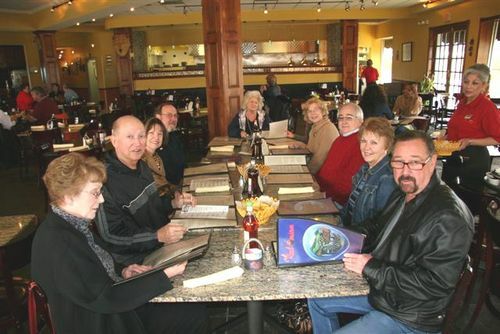 Seen here, left to right: Linda Hocher Bennett, Donald Williamson, Alma Woodward Powers and Jeff Powers, Judee Utgard Schroeder, Doris Lentz Simmons, Fonda Whitt Forrester and Joe Forrester."